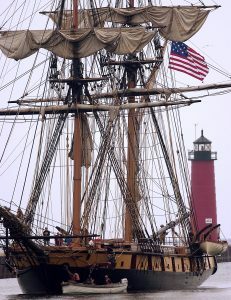 Having the tall ships come to Kenosha is a gift to all of us. They bring educational opportunities, economic impact from our visitors and a greater appreciation for our downtown. We hope you will consider volunteering to help with ship tours, visitor information, the Pepsi Children’s Village, the Kenosha Community Sailing and Yacht Club Sailaway Village and more. The ships providing tours need 8 people per shift (am and pm). This is a good opportunity to bring a team of family, friends and co-workers together. Pre-Training: Volunteers are required to attend one of 3 orientation meetings prior to the event and must commit to work a minimum of 2 shifts during the festival. Kenosha Tall Ships® 2019 is an outdoor, rain or shine event and our volunteers spend a lot of time in the sun and on their feet. Volunteer Guide Book will be available in May.